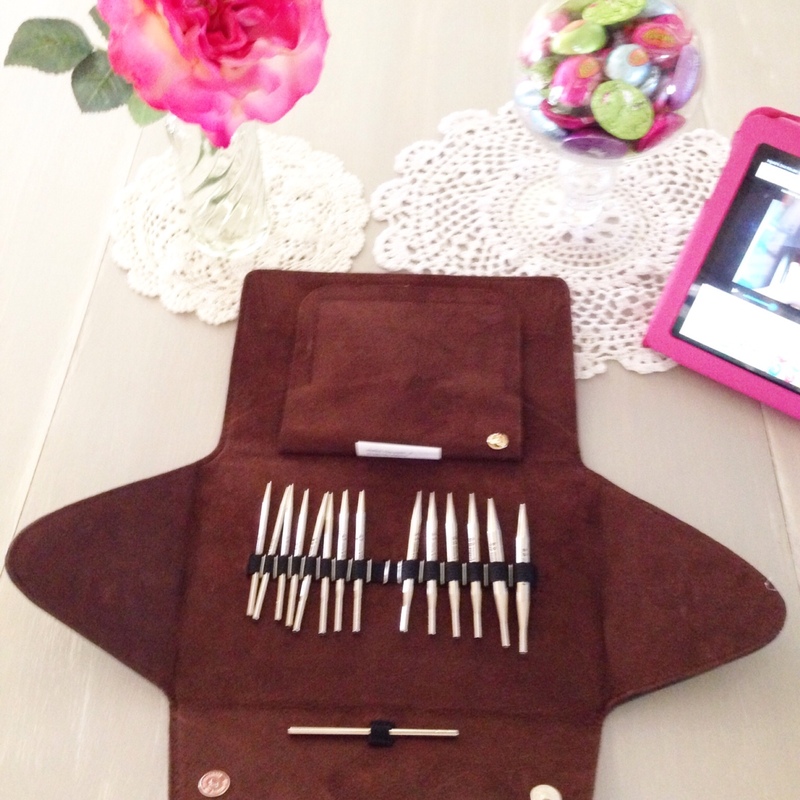 My review on my new Addi Click Lace Interchangeable Needle set….taking knitting to a whole new level! So I received my new Addi Click Lace Interchangeable needle set several weeks ago (yes, I am late in sharing this wonderful news). I must say I am quite pleased and very content with the quality of the needles and really enjoy the smoothness and simplicity of how the cables connect to the needles. A couple months ago I ordered my first pair of size 13 Addis and just fell in love with the quality of the needles and knew right away I was going to want a set that comes with various size options to choose from whenever I’m ready to jump on a new project. I won’t lie and say they’re cheap. Although I shopped around and found them on Fabulousyarn.com for $169.90 (free shipping) I still hesitated before hitting the submit button. I never spent so much on knitting supplies so there was a bit of “buyer’s remorse” afterwards. But that feeling quickly dissipated after my needles arrived and I started using them. Like one of my blog readers commented “you’re in for a treat”…I must say that statement was right on! 🙂 After a couple of hours of nonstop knitting I started to feel the splurge was well worth it. So, some of the things I love about my new Addis are the fact that they are nickel plated, they come in sizes 4, 5, 6, 7, 8, 9, 10, 11, and come with five different lengths (16, 20, 24, 32, and 40 inches) of the blue pliable cord for circular knitting. Also the needle tips are extra pointy making it super easy to pick up the yarn. I have read that some people have experienced snagging where the needle and the cable join but I haven’t had that problem. I find that I knit faster and this I feel is due to the needles being slippery making the yarn slide across the needles so easily. I love the fact that I have so many needle size and cord length options at my disposal which was my reasoning when I was on the fence on trying to decide whether to purchase the set or not. So glad I did. Happy knitting everyone!!! Knitting to my heart’s content…. They are quite expensive, would you definitely say they are better than bamboo ones? are they slippery? How does it work, can you use them as straight needles or just as circular? Yes they are a bit pricey so you would really have to decide if you want to spend that much if you are a dedicated knitter. I also have bamboo needles, straight ones and circular and they are nice BUT what makes the addis more attractive is the fact that they are slippery which causes the yarn to easily slip or glide across the needle more smoothly which results in faster knitting. They come with various cord length sizes so you can either knit something as large as a blanket or as small as socks. Finally, although they are circular needles you can use them to knit in the round or knit something flat like a blanket. Hope this helps if you are considering making a purchase. All the best!